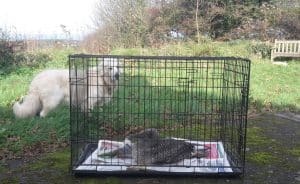 This season brought not one but two major storms - Ophelia and Brian - which devastated the wildlife. Both storms were predicted well in advance so we decided to get Shearwater ashore before they hit. Sea conditions at Porthgain were nice and calm and I had the bonus of a juvenile gannet swimming around the boat as I waited for the tide to come in sufficie ntly for me to bring the boat in to her trailer. Waiting for the tide to come in is rather like watching paint dry, albeit chillier and with a much better view. The gannet got bored and headed slowly up the slipway. 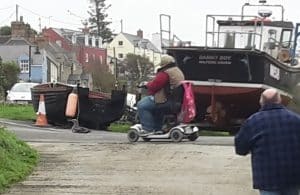 He watched with interest as the boat drove on to the trailer and was brought up the slip and then he decided to saunter into Porthgain in the direction of the pub 🙂 . He was clearly too tired to make it to the pub so he settled down in the road ... Fortunately Lynette saw him and set off speedily to put her scooter in between the gannet and an oncoming car. Shearwater sat patiently parked on the slip while we worked out what to do with the gannet. The bird was exhausted and whilst Lynette had protected him from the car he clearly wasn't going to last the night on his own. Gannets are not the easiest birds to handle and while we carry all sorts of spares in the landie we didn't have a gannet sized cardboard box. So we asked the lovely people at The Shed bistro: 'No problem'. A gannet box was produced with an understanding smile. Tim offered his arm to the gannet to attack, which it duly did (they can't resist attacking anyone in range even when they're exhausted) and whilst its beak was engaged on his arm he tucked its wings under his other arm, held its beak with his free hand and put it into the box. The canine boss surveyed the new occupant of his puppy crate with interest as he supervised us 🙂 . Gannets have to be handled with considerable caution because they're very strong, their necks can snake out a long way and they have sharp beaks. Thick gloves are a must but they can make it difficult to react quickly. This bird was surprisingly laid back for a gannet, perhaps because he was young and exhausted. He was utterly unrepresentative of his kind in that he didn't persistently try to attack us 🙂 . The usual rule of thumb is to assume that gannets will attack at any moment, that their neck can extend far further than seems possible and that they will take no prisoners. The safest approach (there is no safe approach with gannets) is to restrain them gently but firmly by hugging them under one arm so that they cannot extend their wings, with one hand restraining the head and the other the beak. Some people wear safety goggles - gannets have occasionally been known to blind people - but the key is to restrain them very carefully. With storm Ophelia about to hit we had no intention of fishing so we defrosted some fish (caught recently around Ramsey 🙂 ) from the freezer, made sure it was good and wet with salt water (collected from Porthgain 🙂 ) to make it easy to swallow and managed to get him to eat. At first we found ourselves whispering as we went into the back porch (mustn't wake the gannet ...) and we expected him to be afraid of the washing machine but he was so cosy in his crate that he slept very comfortably as we ran around doing the sort of things you do when a storm is coming (like clearing the memory card on the camera 🙂 ). If there was too much activity he would look at us darkly, turn around and put his head under his wing - 'not speaking'. Having worried that he'd be stressed by human activity we then worried that he would get too used to the comfort of a crate and food he didn't have to work for. He needed to put a bit of weight on and to wait for the worst of the weather to go through but we knew that for his sake we couldn't keep him for too long or feed him too well. 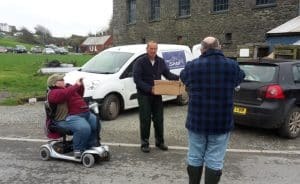 Fishguard vets were kind enough to check him over for us and confirm that he was ready to be released so we took him to Ramsey Sound on an ebb tide (so that the tide would take him in the right direction) and let him go. Of course we'll never know what happened to him but at least he went back to the water rested and fed. We rather missed him but it was nice when the porch stopped smelling like Grassholm. Fun fact: gannets can manage projectile poo through the bars of a puppy crate when they feel like it.